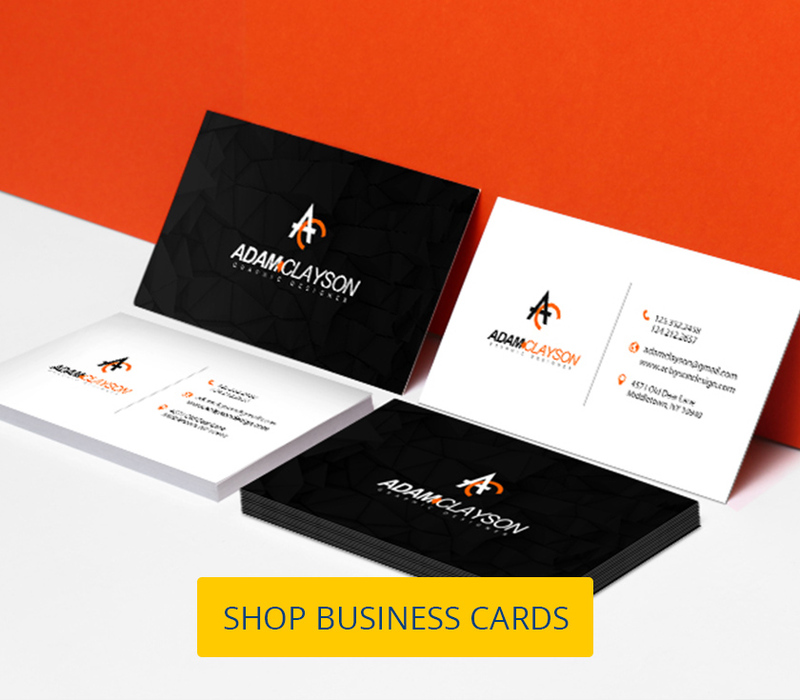 What are the essential characteristics of amazing business cards? 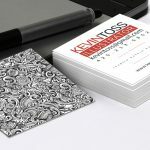 A great first impression is, in my opinion, the number one requirement of an amazing business card. Indeed, aggressive marketing is a huge factor in your success, but it will always start with the first step. Business cards can help you sell yourself even before you start the actual advertising. They are often your clients’ and customers’ first interaction with you so it’s important that they answer the essential business questions of who you are and what you do. 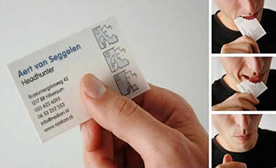 Below are some examples of amazing business cards with clever design on point. First on the list of amazing business cards is this unique card from Intersection Magazine. Nothing could be a better way to market yourself then engaging your customer in assembling your card into a beautiful ‘69 Nissan Skyline GT-R sports car. The time spent by your customer assembling the card means more amount of time for your contact details to be reinforced. And with a card as unique as this, the customer is bound to be impressed with your creativity. Ever thought that bobby pins used for creating elegant chignons and hairstyles could be used for any other purpose? Kudos Design Collaboratory used these everyday hair accessories to design the business card of hair and makeup artist Yuka Suzuki. If you are a hotel or restaurant owner and tired of extra expenses because of broken plates, take a tip from this Greek restaurant. 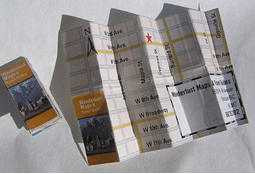 Convert those broken pieces into a way to promote yourself by using them to make your business cards. This card is doubly effective as it plays with the Greek custom of plate smashing during celebratory occasions. Japan has been known worldwide for its high tech technology, new ideas and innovations. 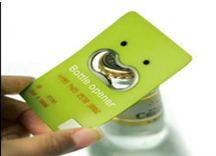 This is apparent from this business card which has been designed as a bottle opener. Who would throw away such a useful business card? This card is perfect for businesses in the beverage industry. Here’s another business card that originated from Japan—a business card pen drive. A pocket USB drive is a great way to promote your brand as you can add more information about your business beyond the limits of a traditional business card. With the price of digital memory cheaper than ever, it’s also an inexpensive way to create that lasting impression. 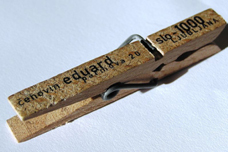 To avoid his business card getting lost in a wallet as just another business card, Fine Arts Professor Eduard Cehovin came up with this interesting business card in the form of a clothes pin. It might not fit a traditional card holder but it’s definitely memorable. A business card is an extension of your profession and James Mahon took this to heart. There isn’t a better way to represent what divorce lawyers do than this card. With a perforation at the middle, each of the divorcees can split the card and keep half of the card with complete contact details. Suffering from asthma and looking for a physician who can help you improve your lungs? Chest Physician Pramod Niphadkar uses deflated balloons to test the lung capacity of patients. 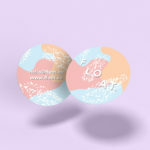 It also doubles as a business card as the details of the doctor’s practice are visible once the balloon is inflated. 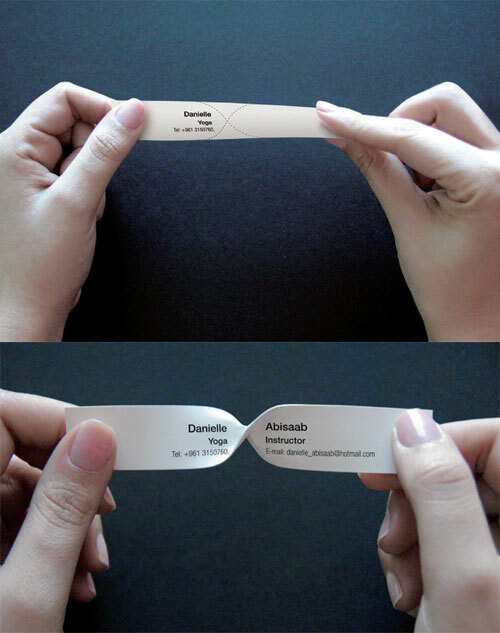 This creative business card was done by Ogilvy & Mather Mumbai advertising agency in India. Acupuncturists helps you get rid of body pain, stress and numerous other disorders by inserting very thin needles at appropriate pulse points. 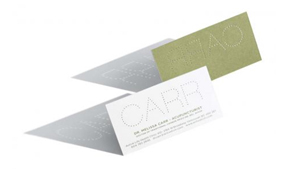 This is the idea behind this clever needle-punched design for acupuncturist Dr. Melissa Carr’s business card. This card was created by creative agency Rethink Canada. 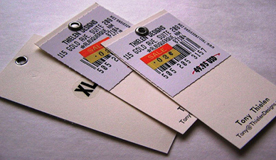 Would you be more likely to visit the store of a label selling 50 dollars worth of goods for just 2 cents? That’s the concept used by designer Tony Thielen for his business card. With a “price” like this, there’s definitely no need to look further. Our next design is the perfect example of form and function. 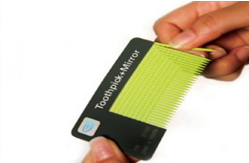 Designer Ji Young Chun came up with a business card design that doubles as a mirror with toothpicks attached to it. It’s a useful tool that recipients can use after lunch or dinner in addition to seeing your contact details. Discretion is the hallmark of a good headhunter. This philosophy has been taken to heart by Aert Van Seggelen in coming up with this lovely edible card. Created by Publicis Dialog from The Netherlands, the card comes with the instruction “eat after reading” to remove all visible traces of communication. Now this is one smart move. It makes me wonder though, what does it taste like? The job of a personal fitness trainer is to inspire you to stretch and sweat in order to achieve that dream look. And if personal trainer Paul Nielsen can inspire you to stretch his business card to be able to read his business details, then he can surely motivate you to move! An x-ray of a broken hand has been used by debt recovery agent Rajesh Rajan to drive home his point rather aggressively. Who wouldn’t like to get rid of their debts faster after receiving the x-ray of the last client? A witty line can be used to register yourself in your client’s memory. Banking on his name, Dave Blank designed his business card with a simple one liner that offered memorable impact. Are your teeth strong enough to do this? 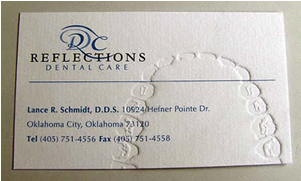 Dr. Lance Schmidt used the embossing of teeth to advertise his Reflections Dental Care practice. A simple design in white and blue with just engravings representing desirable white teeth make this card simply attractive. 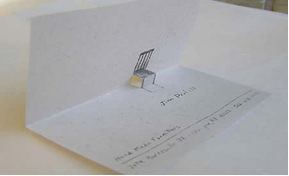 This business card from furniture maker Jim Proffitt evokes the fond memories of your first dollhouse. It promotes his line of handmade furniture with a small chair popping up upon opening the card. It’s a simple and minimalist die-cut design but this card will surely make you want to visit the store to look around for yourself. Security consultant and white hat “hacker” Kevin Mitnick took functionality to the next level. His metal die-cut business card is designed to look like a set of lockpicks. That’s because it is a set of lockpicks. Check out this video of Kevin Mitnick’s business card lockpick in action. Finally, a chocolate and business card combined! Especially if you are in the sweets industry, this edible business card can put a great taste in the mouths of your recipients. Just don’t forget to give a card that they can keep without melting. Here’s an obscure but clever one for photography enthusiasts. 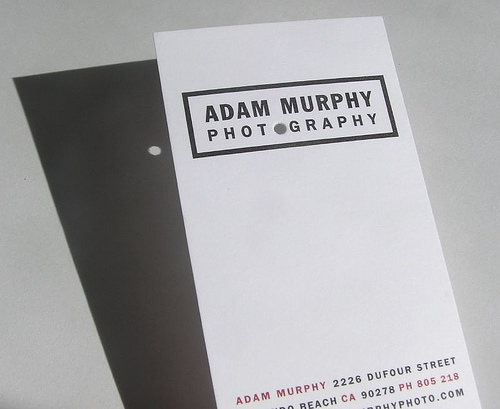 Photographer Adam Murphy added a simple die-cut to his card. It’s a small pinhole to stand for the letter O in photography. True to its roots, this card actually functions as a pinhole camera, one of the earliest forms of the camera we know today. Want a sample of what you’ll expect in a yoga session? 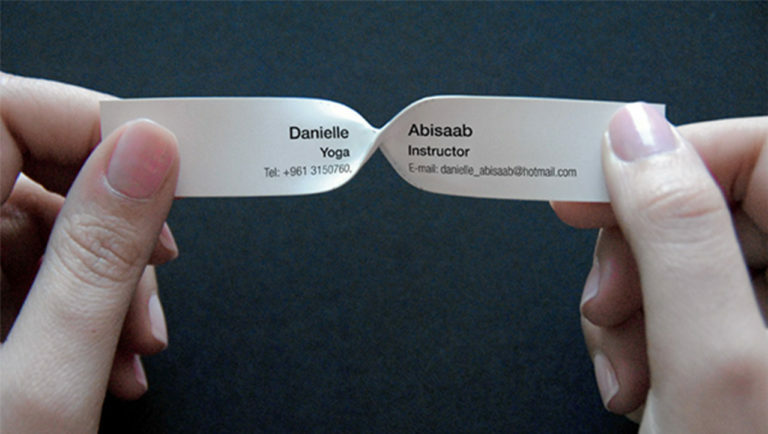 This PVC business card from yoga instructor Danielle Abisaab would do just that. Experience the twisting and turning that your body will undergo with this bendable business card. This design was created by Kapil Bhimekar. 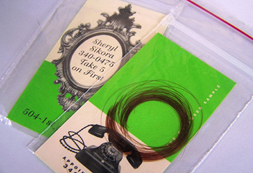 Packaged in a plastic ziplock bag to show some hair strands, forensic expert Sheryl Shikora’s business card makes a bold statement with its fluorescent green and white colors featuring graphics suitably publicizing her profession. Planning to travel around a city and looking for a travel guide or road map? Wanderlust Maps and Travel Guides will help you find the coolest destinations with their set of thousands of maps and essential guides. Even their business card is a map that leads you to their location. Neat! 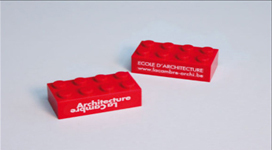 Belgian architecture school La Cambre used lego building blocks to advertise their expertise. According to their creative agency Leo Burnett, this card perfectly represents the school as a foundation of young architects. 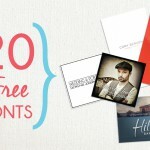 Take your business card design to an entirely new level! I hope you were inspired by one or more of these amazing business cards to come up with your own unique design. 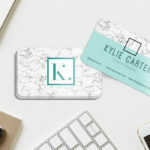 When you’re ready to print your own business cards, head to our business card printing page to get them now. I really like your collection of business cards. Thanks for the interesting story. 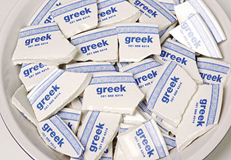 The Greek “Cards” refer to the way people cast ballots in ancient greece. These are great business cards. I’m just curious though if you make these kinds of business cards because i always get asked where or which print company can make them. I always like creativity with a unique taste. And this just fits right in. Now I can work on the idea on how to design my biz cards.